Shearing finally happened on Monday and Tuesday. To say shearing is a lot of work is an understatement. So much mental and physical stress for The Farmer. The weather plays an integral part in it all. We do not have barns to keep all the sheep dry and so we just hope for several dry days prior to our shearing date. You all know how much control over the weather humans have. It has been a very wet June/July in western Massachusetts (after a very dry April/May). We have had to re-schedule our shearing date twice already. Shearing a few hundred sheep is one of those awful jobs that I just want to be over - for all of us. The sheep will be cooler without their wooly coats and it will be over for the humans for another year. Funny thing is, we never know how many adult sheep there are until shearing day is over and we pay the shearers their fee per animal. The shearers use a tally counter that is similar to a row counter for knitters. After each sheep, they click the device so that they know how much to charge us. All the adult sheep must be brought in from their various fields to the pastures in front of our farmhouse. That takes The Farmer days. It was a bit more complicated because many of the sheep have small lambs with them. Our trailer only fits 16 adult sheep at a time. I help a bit - but frankly, I have just been too busy to be of much assistance this year. The day before shearing, with the dogs, a little help from our friend Alyssa, and extra fencing, we moved over 300 sheep all into one field. The mobile sheep handling unit was put in place in the shade of some maple trees where the ground is pretty level. Very early in the morning on shearing day, we moved the sheep into this holding pen. 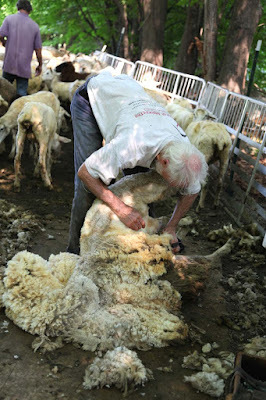 The shearers arrive before 7 a.m. and we hope for the best. The Farmer grabs each animal and hands them off to the shearers who are set up inside the movable fencing on plywood planks. Kevin Ford shears with blades. Gwen Hinman shears with electric shears. Gwen usually does 1/3 or 1/2 more animals than Kevin. I think the two of them keep each other going fast all day long. Kevin and Gwen are so remarkable. 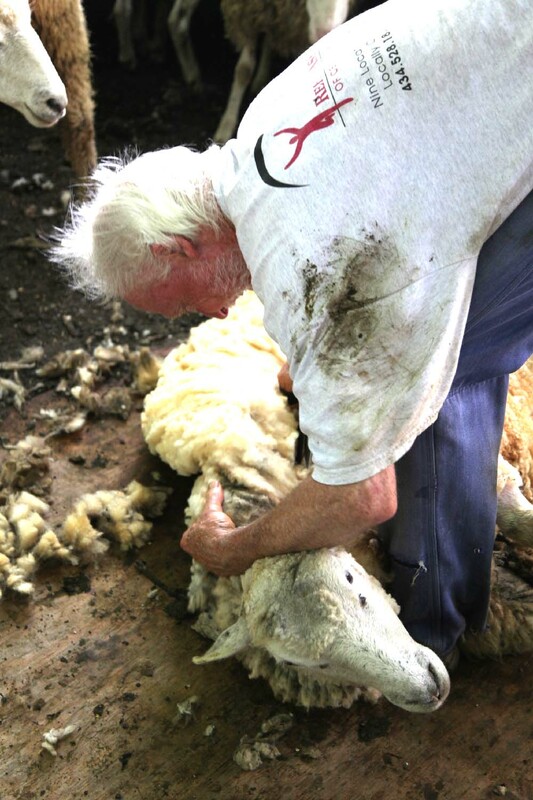 Kevin is way past 60 and has been shearing for years and years and years. He has competed in shearing competitions all over the world. He writes a column on shearing in Sheep Magazine. He has even written a book called Shearing Day which you can buy via Sheep Magazine. Gwen is just 40 and has been shearing since her mid 20's. 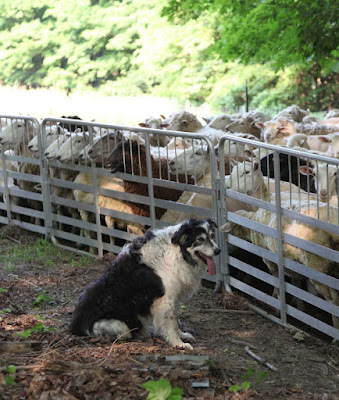 She learned the trade from her father who was also a sheep shearer. She grew up with sheep and told us that when she was a kid she didn't like the sheep because they always got out of their fencing. Funny that she has spent her career with sheep. 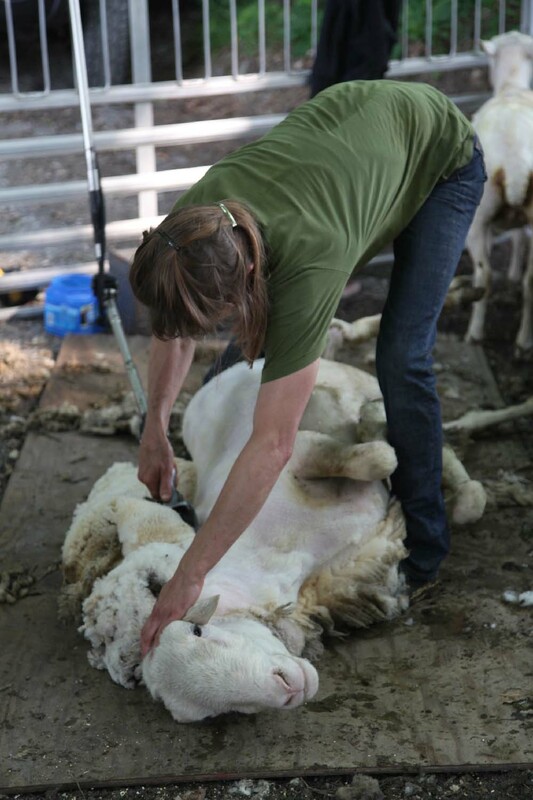 This series of photos of Gwen show her shearing our 300 plus pound Polypay ram. She moved him around as if he were a kitten. What skill. Both Kevin and Gwen travel all over the countryside - up and down the east coast - shearing flocks - large and small. The stories they tell.... 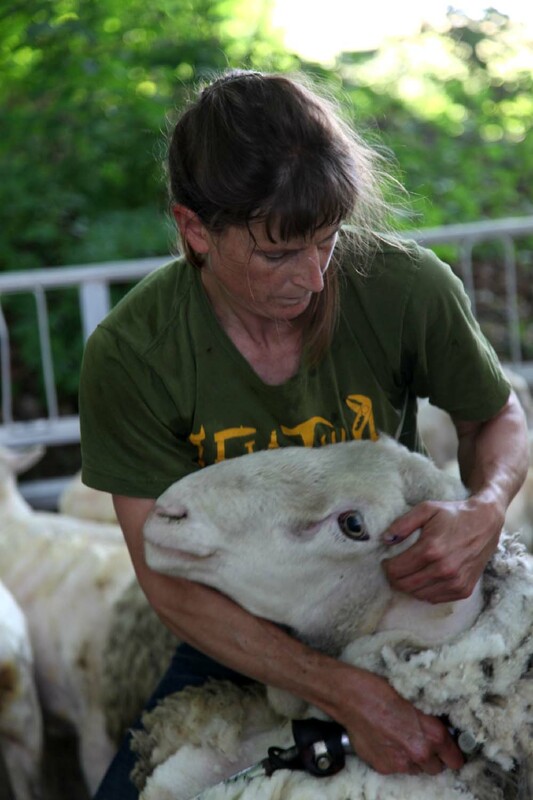 The people they meet..... That is my favorite part of shearing day - spending time with the shearers and reconnecting after a year apart. And listening to their stories. Lunch is usually the high point of the day. I try to please them because really it is the food and the company that will be remembered and will keep them coming back. Good food goes far. We sit around the table for at least a half hour. Kevin told us a story of shearing in Australia with an elite shearing crew. The shearers were fed in the barn - not in the house. He said the shearing crew wouldn't go back to shear at that farm again because they were not treated to lunch in the house. He said "elite crews" pick and choose which farm they will shear at. After lunch, it is back outside to the dirt and the muck and the sheep in their lanolin soaked wool. This year shearing went on for two days. I helped all day Monday sorting and throwing wool around. By the end of the day, I was so dirty and stinky and I couldn't wait to take a shower. All I could think of was one of my favorite sayings about farm life - "The glamour never stops." The Farmer could barely move by the end of the day. We had to give him a crook to get up off the couch that night. As usual, we talk about getting rid of some of the sheep because there are too many. The plan was to have the sheep stay in their enclosure overnight until Tuesday's shearing. 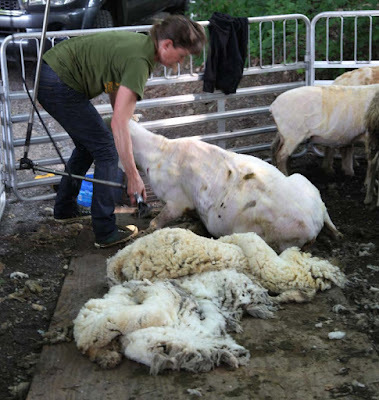 They busted out right after the shearers left. We got them into a field with electronet fencing. Overnight, they had escaped and gotten into our neighbors garden. The sheep don't feel like themselves after shearing. Their smells are gone. The lambs can't find their mamas. They are disoriented. It is a very noisy night full of baaaah baaaah baaaah. Thank goodness they sort themselves out in a few days. Shortly after dawn, before I could even get outside, The Farmer and the dogs got the flock back down the hill. We got them into their enclosure again. By 7 the shearers were back and began again. I had to pack and ship my orders, pack my clothes for the rest of the week here in Detroit, and pack up meat to sell at the Tuesday Northampton Farmers Market. Mark, Kevin, and Gwen carried on and finished up the shearing before noon. The wool wasn't good this year - most of it was matted and wet. But the sheep will be cooler, the flies and maggots will stay away from them for the rest of the summer. 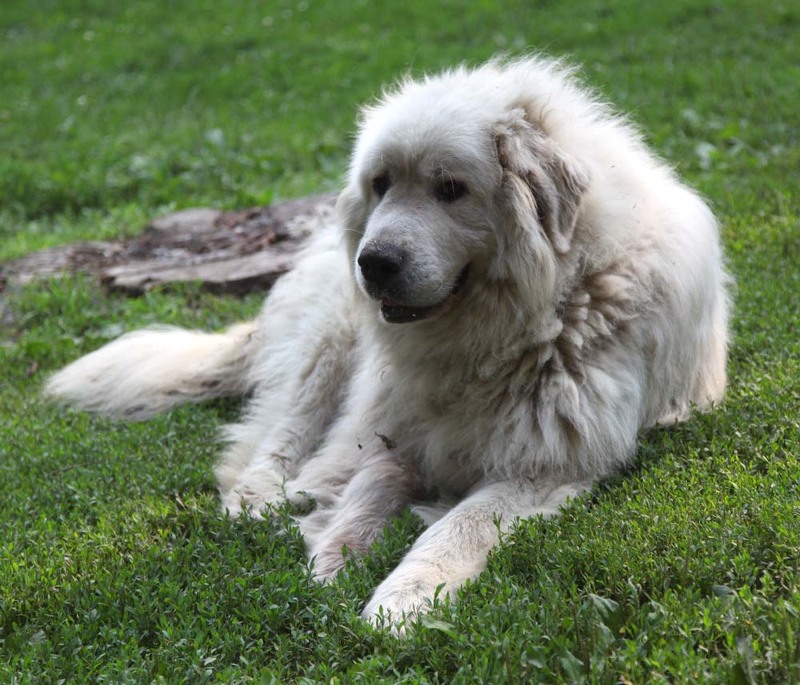 We can check their condition easier without their thick coats. Breeding season is coming soon. The rams need to be sorted out of the flock to be held away from the ewes. They will be introduced again in the middle of August when the ewes will become fertile. The cycle continues. I am reading a book called The Shepherd's Life by James Rebanks. It is the story of a farm and a farming family in the Lake District of England. I gave it to Mark for his birthday and now it is my turn to read it. I am almost done and really enjoying it. If you like reading about agriculture, families, farming and history, I highly recommend it. This book is getting lots of notice including reviews in the NY Times and more. Check it out. No sugar coating of the truth. Thanks to one of my blog readers for leaving a comment on the blog back in March alerting me to The Shepherd's Life. Right now, I am in Detroit taping Knit and Crochet Now. I feel so far away from my normal life, my family, our farm and animals. At dinner last night, I told my colleagues about shearing and the wool and the work. Their eyes glazed over. They really could care less about it all. The muck, the dirt, the sweat, the physical work of it all. I think that so many knitters and wool lovers have a way too romantic view of a sheep farmer's life. No one really wants to know what goes into making their wool. But know that behind every skein of yarn you knit or crochet, there is a farm family working hard to grow wool as one of the products that their sheep produce. It is really a miracle that fibers grown on the backs of animals are spun into yarn for all of us to work with. Winston was close by all day, keeping an eye out for everyone. Poor Kate had to be in her crate because she couldn't control herself and calm down. What a pup. Thanks to you and your blog, every time I pick up a skein I think, "I wonder where you came from?" I may not know the answer but knowing there are many people who touched that lovely wool/yarn to bring it into being makes me very thankful for the farmers and spinners and mill workers sand shop owners who dedicate themselves to their work. Thanks for helping me keep perspective. Any people wonder why yarn costs so much! I loved reading every single word of this post and the pictures are just lovely, especially the one of Gwen holding Polypay by the ear. How interesting about the workers and food. My life has always been surrounded by food as I am Greek and feeding folks good food inside or out on the patio, if dirt is a problem, the tablecloth still comes out with real plates, glasses, silverware, cloth napkins and so on. Just as if they were company. I'm glad that you tell the reality of the farmer's life and the very hard work that goes into each skein of wool. Frankly, it makes me more likely to pay for a skein of American produced/dyed wool because I want to support a small business farm family. I can't afford to buy as much, but I feel better about it! Talk about having a foot in two different worlds! Kudos to you for trying to inform your followers about one element that produces the wonderful wool yarn that we all love or the lamb that tastes so good. From one who's been there I can verify there's nothing glamorous about the farming life unless you enjoy living on the edge; freezing or sweltering, vermin, predators and pestilance, fickle markets, etc. Clearly, you're preaching to the choir here. Thankfully though, there are still folks like you who are willing to take such risks. I,m a long time reader and throughly enjoyed this post. BTW, my back is aching just from LOOKING at those pics of Kevin & Gwen! If I were ever to get into that position, I'd lockup and need someone to PRY myself apart! ow. Crunchy-CHIRO-*hugs* all round!! You know, I've been toying with the thought of having Cards done to go with my stuff at craft shows for the People who "glaze-over" at any of my Prices [I *only* use 100% cotton and wool] -- "..Boll Weevils STARVED and Sheep got *NAKED* so that I could *make* THIS STUFF for you!" -- Not certain if it would help with Sales, but, it might "educate" them for a nano-second! I am so glad that you continue to make time to share your life through your blog, on top of all of the challenges of your farm life and art business life. 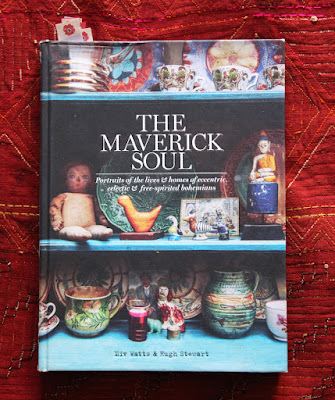 I really believe that education and marketing is what makes or breaks the connection between crafters and the story of their resources' origins. 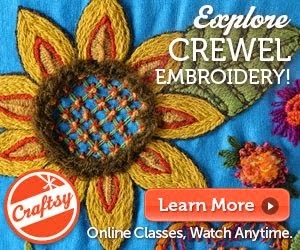 It is a shame that a program with "knit" and "crochet" in the title wouldn't show more interest in the behind-the-scenes reality that brings the beautiful yarns to our hands, hooks, and needles. Obviously not everyone is going to be a farmer, but the basic knowledge is very useful in helping a fiber artist select the best yarn to make the most of their project. I even have to educate the person who is receiving a project so that they know how to best care for it. Thank you for your blog and keep it up! We love it! I'm exhausted just reading about the shearing and about your schedule. It is a challenge.